2nd June 2016 - Hubert, North Carolina to Newport, and on to Atlantic Beach, North Carolina. I didn’t sleep a lot last night – last day nerves kicking in!! I started the day putting my normal post on facebook – the route for the day, the elevation profile and whereabouts we were in the big picture!! While it seems ages ago since I did this for the first day of our journey – I remember thinking OMG that morning – we have so far to go!! Yet here I am – putting up the map with the last 60 kms to go!! I was so pleased that we had all made it safely this far – and well aware, that we couldn’t let our attention to safety matters lapse today to spoil all our hard work. I just hoped everything would go well!! In fact, for the last few days I have been thinking like this!! I did wonder how the day would go when we were about to leave and Don couldn’t find his bike helmet. We searched high and low – no sign – the only place it could be – was in the tent that had been folded down and packed up!! It had seemed a bit more of a struggle to fit into its original packaging that morning …………….. sure enough – an unpack of the tent – and there it was!! It would be very remiss of me not to mention that a few mornings earlier in the week Don couldn’t find his helmet – and when he asked Pat if she had seen it – her reply was – well what is that on your head!!! Great find Pat – well done!!! There should have been a reward on offer for finding that missing helmet!! Back to today’s ride – it was a pretty straight forward one – and after churning out long distances over the last few days – the final 60 km today was a very comforting thought!! The day was cloudy, looked like maybe a shower or two – but great biking conditions. Biking from west to east had meant we normally had sun in our eyes every morning – so clouds were good!! 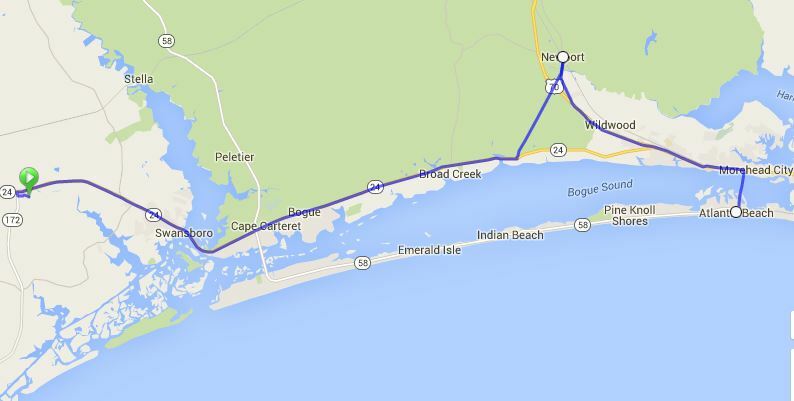 We had a good shoulder on a 4 lane highway for the first 10 kms, and then we reached the built up area of Swansboro. Traffic generally was good, except later Annie and I both remarked about a school bus that went past us awfully close!! We were very close to the sea through here and the area was really a string of smaller villages all joined together. Further ahead was Morehead City and I suspected the traffic could be commuters travelling to work. In the area round Bogue – some bogan had dropped large builders staples on the road and I copped one fair and square on my by now well worn and flattened off rear tyre. This tyre incidentally had been on my bike since my bike was serviced on my return from the UK ride a year ago so it has done pretty well! With a couple of time commitments today it was an easy call to get Don to change both my tyre and tube – thanks Don!!! He’s really good at it now so we were on the road with very little time lost!! Before too long we came to the left hand turn to take us up Hibbs Rd to Newport. We crossed Hwy 70 and “Roberts Rd” and arrived at a sign saying 1 km to go!!!! I rang through to the Town Clerk – Kelley – who has been a wonderful facebook follower of our journey – and she gave me directions on where to head to. In a country where we don’t know many people (we do know more since this trip) – to ride to the “finish line” of our “Newport to Newport” ride in this smallish town – and see Kelley and her crew roadside with flowers to welcome us was a very special moment that will be treasured. My brother from New Zealand also rocked up – he’s covered a few miles in the USA since his surprise visit in Ozark! It was great chatting to these folk and finding out more about Newport, North Carolina and then local pressman “Mike” turned up for interviews which took place in the Council Chambers – right next door to the library. We did have a giggle that this was my longest “Library” ride yet - those who I ride with back in the “Newport” I live in will understand that one!! After such a pleasant time in Newport it was back on our bikes to complete the Pacific Ocean to Atlantic Ocean journey. About another 20 kms to go. We went via Hwy 70, which became pretty busy through Morehead City and biked along until we got to the Atlantic Bridge and Causeway. Mike had advised us just to keep going straight ahead until we reached the boardwalk – right on the Atlantic Ocean. A photographer – Dylan – was waiting and he came down to the sea to watch us “dip” the bike tyres in the ocean – completing our journey!!! The beach was beautiful, the sea was wonderfully warm, the sun was out – oh what a feeling!!!!!!!! The press work fast there - this was about 12 noon Thursday - and the next day we were in the paper!!!! We lunched at a beachside, but sadly no beach view café and enjoyed “bubbles” to toast completion of a successful ride!! After lunch – the puzzle to pack all bikes, luggage and people in to the van was completed and we drove to the other end of this island (about 20 kms) and returned to the “mainland". A quick stop and rendezvous with brother Peter over some afternoon tea – and we were on our way – to Wilmington where Annie and Don were staying before starting their journey “back” west. For Pat and I – we continued on to Shallotte – to start our long drive back to LA along a more southern route!! Funny – but nice – being a passenger in a vehicle!! Funny for Pat to be able to drive at normal speed for long stretches - and have someone to talk to!! Funny that I sit in the car looking at the road shoulders – have seen some we would have loved – and other nightmare ones!!! I remember reading facebook posts from someone riding in USA complaining about the rumble strips – I now know what she means!!!! The thoughts and emotions on the last day of a big ride are always many and varied and I have never managed to really put them into words. I always have a mixture of elation that I have completed a dream, and yet sadness that it has to end!! Along with that comes reflections of times throughout the journey, the tough times, the great times, the places I would like to visit again, the places I am glad to have seen, but won’t return to, and the many people we have met and the kindnesses they have bestowed on us. I certainly know those 11 States of USA a hell of a lot better now than I ever did before!